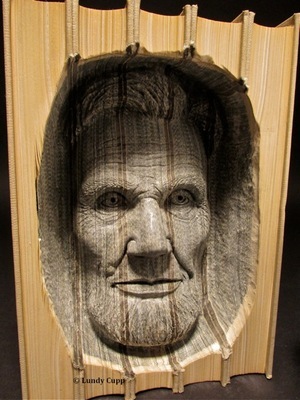 Tennessee sculptor Lundy Cupp has carved faces into many objects: tree trunks, walking sticks, and yes, even pumpkins. He has also set his chisel to books--“primarily old encyclopedias,” he wrote in a recent email--to create fine visages in paper. Abraham Lincoln, for example, was sculpted from the 1964 Encyclopedia Britannica, while Albert Einstein was excavated from the 1969 American Peoples Encyclopedia. “I have a very long list of iconic people that I would like to do,” Cupp added, naming Shakespeare and Twain in particular. His faces, some whimsical, others solemn, are reminiscent of the altered book art of Guy Laramee and Brian Dettmer. Take a gander through his gallery. Image: Courtesy of Lundy Cupp. Tennessee sculptor Lundy Cupp has carved faces into many objects: tree trunks, walking sticks, and yes, even pumpkins. He has also set his chisel to books--"primarily old encyclopedias," he wrote in a recent email--to create fine visages in paper. Abraham Lincoln, for example, was sculpted from the 1964 Encyclopedia Britannica, while Albert Einstein was excavated from the 1969 American Peoples Encyclopedia. "I have a very long list of iconic people that I would like to do," Cupp added, naming Shakespeare and Twain in particular. His faces, some whimsical, others solemn, are reminiscent of the altered book art of Guy Laramee and Brian Dettmer. Take a gander through his gallery.